Capture your vision in this outdoor workshop that blends creative expression with instruction in formal technique with painter Todd Bonita. We will attempt to cover both sides of the creative process to help you develop your innate intuitive ability alongside the academic skills required to refine your vision into art. We will present a spectrum of outdoor painting strategies. Immerse yourself in spontaneity and “big seeing” while honing technical skills in drawing, color mixing, composition and design, paint handling, and the formal elements of picture making, such as line, shape, value, and unity. 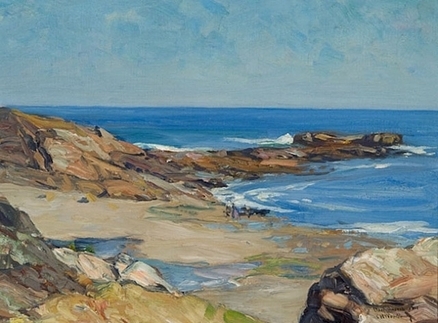 This workshop takes place in the Southern Maine, coastal town of Ogunquit, Maine, home to one of America’s original art colonies and a renowned plein-air painting summer school founded by influential Perkins Cove Artist and teacher, Charles H. Woodbury in 1898. We will discuss Woodbury’s teaching philosophy as it relates to the “art of seeing,” perceptual drawing and painting. We will paint in this picturesque, coastal nook in the shadows of Homer, Hopper, and Henri. Demonstrations, discussions of plein-air painting, handouts, side-by-side easel critiques, creativity coaching and academic training while painting in the field. * Balance of $200.00 due 30 days before the workshop. * Cancellations less than 30 days before the workshop forfeit their deposit. *(Last year sold out and wait listed, this will fill). Plein air painting supplies(Click here for an illustrated page detailing my Plein air kit). * Meet on painting locations with your supplies. * Classes meet on location daily from 9am to 4pm with a one hour lunch break from noon to 1pm. Bring lunch, snack, water. All locations have parking and bathrooms nearby. Tuesday: Perkins Cove, Ogunquit, ME. Meet at the Todd Bonita Gallery across from the drawbridge. Park in the all-day lot at the entrance to Perkins Cove, rather than the three hour metered parking. Meet at the entrance by the parking lot. Meet in the parking lot. Bathrooms across the street at the camp ground. If you are inclined, we can all have dinner at the Lobster pound as a group at 4:00 at the end of class. Meet in the parking lot near the lighthouse overlook.